1 of 2 Soak skewers in warm water. Combine sirloin, balsamic vinaigrette and soy sauce in a resealable plastic bag. Refrigerate 30 minutes. 2 of 2 Heat gas grill to medium-high or coals in charcoal grill to medium hot. 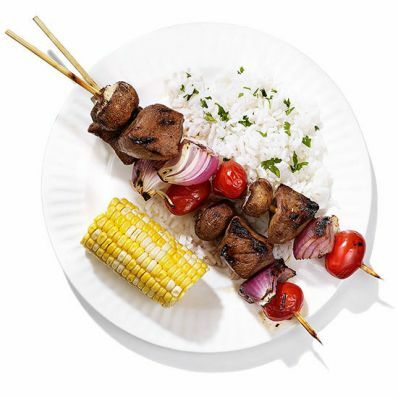 On a skewer, thread 1 baby bella mushroom, 1 beef cube, 1 wedge red onion and 1 grape tomato, and repeat to fill skewer. Continue threading to fill 8 skewers. Grill kabobs 3 to 4 minutes per side, until cooked through. Serve with corn on the cob and rice.